Devices for Political Action. The Collective Towns in Iraqi Kurdistan. Francesca Recchia and Leo Novel. This essay looks at the case of Collective Towns in Iraqi Kurdistan as an example of how State interventions on the ground are often instruments utilised to implement broader political plans. Throughout the 1970s and the 1980s the Iraqi government made full use of spatial planning as a constitutive part of the strategy of "dealing with the Kurdish problem". Recchia's argument is that the Ba’ath regime adopted urban planning and space design as social engineering devices in its larger scheme of shaping society into a more homogenous and simplified form. The Iraqi government used the combination of ethnopolitics and a centralised ideology of modernisation to heavily intervene in the management and design of territory, causing a systematic disruption of local knowledge and practices. 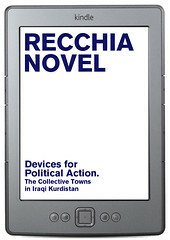 The e-Book includes a photo-Essay by Leo Novel about the Mujamma'a or Collective Towns which initially responded to a logic of rationalisation and cost-effectiveness, but was successively turned into one of the political tools that the regime of Saddam Hussein used to manage the tensions with the Kurdish population of Iraq. This is the third e-Book of dpr-barcelona's series Emancipatory Space, about politics, economy, law and architecture. This series of e-books intend to spread texts that challenge conventional relations of such subjects.